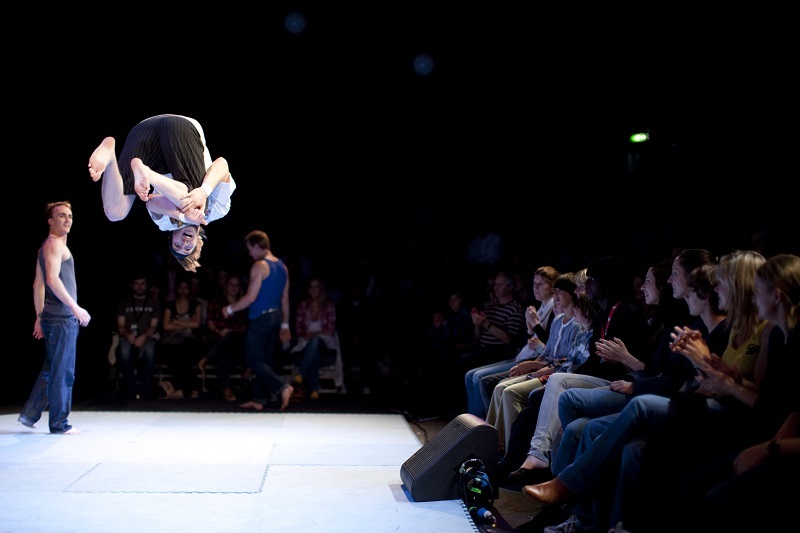 Creative Carbon Scotland contributes to several sustainability initiatives at the Edinburgh Festival Fringe: one of Edinburgh's major Festivals, and the largest arts festival in the world. Find out more about the award, the guide, the swap shop and the drop-ins! The Edinburgh Festival Fringe Society produces a guide to support and advise companies and venues taking part in the Festival. Covering everything from publicity and travel advice, to tips for working in venues and communicating to effectively to contractors, the guide is essential for those planning a show, in preparation for arriving in Edinburgh, and whilst undertaking a production in the city. On the final days of the Edinburgh Festival Fringe, Creative Carbon Scotland co-hosts the Fringe Swap Shop inviting companies and individuals participating in the festival to bring good quality props, costumes and set materials to be reused by other productions or members of the local community. Participants can contact Fringe Central or participants@edfringe.com to find out more about what can be donated. While the dropping off of items is limited to companies and individuals participating in the Edinburgh Festival Fringe, the collecting and reusing of items from the Swap Shop is open to anyone, and can be an excellent opportunity to acquire free wood, stage props and fabric, amongst other materials. If you’re interested in recycling production materials outside of the August Edinburgh Festival Fringe, there are lots of other reuse and recycling opportunities for the artistic community. For information on recycling sets, or set exchange, try 2nd Hand Scenery Scotland, Scenery Salvage or Set-Exchange . For an opportunity to donate or exchange a whole range of materials (like props, costumes, carpets, furniture and electrical equipment), websites such as Freecycle, Gumtree and Triad (for clothing) extend the potential network of users both thematically and geographically. 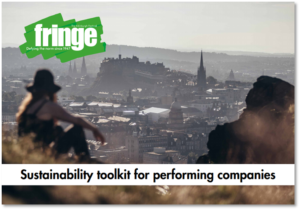 First launched in 2010, the Edinburgh Fringe Sustainable Practice Award celebrates the best of sustainability and sustainable practice at the Edinburgh Festival Fringe and highlights the different exciting approaches Fringe productions are taking to sustainability. The award is not being hosted in 2018. 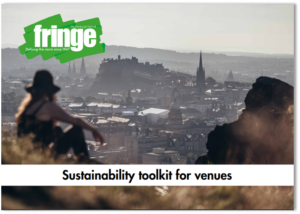 The award invites all Fringe productions – whether they’ve just started thinking about recycling or whether they’ve been bike-powering venues for years – to apply for this high profile award, and to tell us the new ideas and new ways they have for engaging with sustainability. Previous recipients include: The Pantry Shelf, produced by Team M&M at Sweet Grassmarket; Allotment by Jules Horne and directed by Kate Nelson, produced by nutshell productions at the Inverleith Allotments in co-production with Assembly; The Man Who Planted Trees adapted from Jean Giono’s story by Ailie Cohen, Richard Medrington, Rick Conte and directed by Ailie Cohen, produced by Puppet State Theatre; How to Occupy an Oil Rig by Daniel Bye; A Comedy of Errors and Macbeth by The HandleBards/Peculius; Lungs by Paines Plough at Roundabout; and Are We Stronger Than Winston? by VOU Fiji Dance. The award is run by the Center for Sustainable Practice in the Arts and Creative Carbon Scotland with media partnership from The List, and is supported PR Print and Design. Have a look through our #GreenFests archive to find out more about the previous winners and shortlisted shows. Keep an eye on our August event listings, the Fringe Participants Centre Programme, for events connected to environmental sustainability. The Edinburgh Festival Fringe Society is a member of our Green Arts Initiative.